Our campsite is located about 80 km from Barcelona, the cosmopolitan capital of the Spanish region of Catalonia. A city in constant turmoil, Barcelona always has more than one trick in its bag to entertain you and get rid of the boredom of your daily life thanks to its extremely rich and varied cultural programming which will make you discover its artistic events (music, theatre, dance, etc.)) but also its museums, exhibitions and outdoor sculptures. Come and admire the impressive basilica of the Sagrada Família and other emblematic buildings of this city renowned for its charming architecture typical of Catalan modernism, the most famous of which are the Catalan architects Antoni Gaudí and Lluís Doménech i Montaner. Many of these modernist buildings, such as the famous Güell Park known for its splendid mosaics and eccentric curves, are classified as UNESCO World Heritage Site. Barcelona’s vitality beyond the Ramblas and its monuments is also its fabulous football team, FC Barcelona known as Barça, of international notoriety. FC Barcelona is now one of the biggest clubs in Europe. It is now in the Top 3 of the world’s largest clubs and has more than 320 million followers on social networks. The Camp Nou, Europe’s first stadium, has an average attendance of around 75,000 spectators at each match and can accommodate nearly 100,000 spectators. In Cala Llevado, we welcome fans of the biggest European clubs over the period from February to May, with the direct elimination matches of the Champions League (Round of 16, quarter-finals, semi-finals). Indeed, FC Barcelona plays the Champions League every year with an average of 12 matches per year, including 6 at the Camp Nou. Located an hour’s drive from Barcelona, Cala Llevado offers tremendous potential for fans from all over Europe and Spanish people not residing in Catalonia. Very affordable, the campsite welcomes them in a magnificent setting on the Mediterranean coast. Chalets, cabins, pitches facing the sea, swimming pool, water sports and entertainment complete a trip where the pleasure of sport rhymes with relaxation. The Barcelona shuttle bus has a stop in front of the Cala Llevado campsite! Fans can travel from Barcelona airport to Tossa de Mar, by boarding the shuttle when getting off the plane, or from Barcelona station to Tossa de Mar by taking this shuttle in the centre of Barcelona. 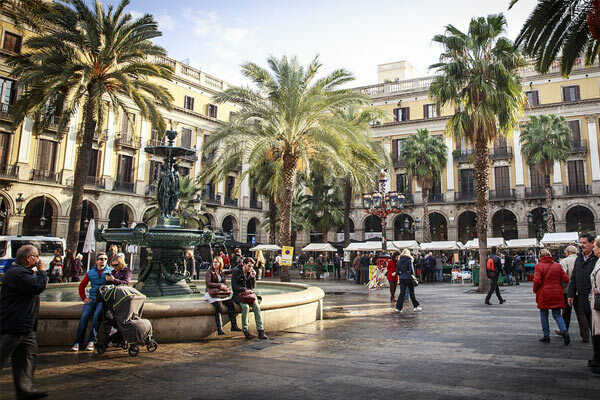 Indulge yourself by strolling along the magnificent waterfront, in the many green spaces and beautiful pedestrian streets of Barcelona’s old districts. Take the opportunity to visit the Pablo Picasso Museum because it is also the city where the famous Andalusian painter lived, and let yourself be surprised by the largest and most spectacular Aquarium in Europe as well as by the superb animations of the famous Ramblas. You will also enjoy Montjuic Park located on a beautiful hill from where you will have the chance to have a breathtaking panoramic view of Barcelona and its monuments, as well as the turquoise blue sea of the Mediterranean and the sumptuous port of Vell. On the festive side, you will not be disappointed by the Catalan capital, which has managed to preserve traditions and popular culture, as evidenced by the Mercè Festivals or the festivals of the districts of Gràcia, Sants or Poblenou. As for gastronomy, there is something for everyone: for the pleasure of your taste buds, the Barcelona imagination has been able to enhance the region’s terroir, from fish to charcuterie products, olive oil, not to mention traditional pastry and sparkling wines.